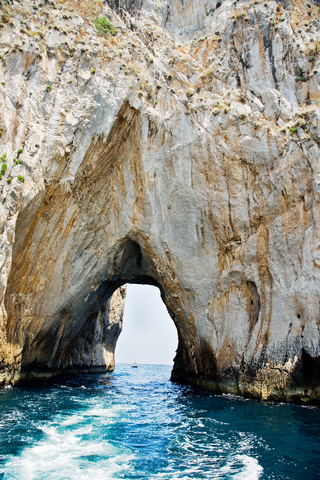 From the boat you will see the Big Marina, Tiberius' jump, the white grotto with its natural statue of the Virgin Mary, the Natural Arch, the green and coral grottos, through the Arch of Love at the Faraglioni Rocks, past the little Marina and onto the Blue Grotto! After the Blue Grotto, you will have time for lunch, you will then travel first to Anacapri and then on to the main village of Capri. Here you will have the chance to visit the Villa San Michele, to ride on the chairlift to the highest point of the island, Mt Solaro to see the famous main square called the 'Piazzetta,' the Caesar Augustus Gardens as well as time for shopping and strolling. From Capri you will head back to the port to board your ship - after your day of viewing Capri from land and sea. Please note: That this tour takes the chairlift (similar to a ski lift) many feet above the earth if you are afraid of heights let us know and we will make alternitive arrangemets for you. Don't forget your camera. This tour has a minimum number of 6 people but can be priced for larger or smaller groups. Please note: That this tour takes the chairlift (similar to a ski lift) many feet above the earth if you are afraid of heights.